Once we have mastered all of the empty-hand forms in Ip Man Wing Chun (Siu Lim Tao, Chum Kiu, Biu Gee), we can then learn Mok Yan Jong, the legendary wooden dummy form used by Ip Man in his style of Wing Chun. Mok Yan Jong as a form is the practical application of the three previous empty-hand forms, making it an essential requirement to master them all before learning Mok Yan Jong. 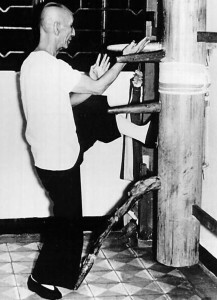 In order to learn Mok Yan Jong correctly, we must first able to identify the wooden dummy specific to Ip Man Wing Chun. There are plenty of different wooden dummies used by all styles of kungfu; however, the wooden dummy that we are using must be the same as the dummy used by GGM Ip Man, in terms of it’s shape, size, structure and materials. 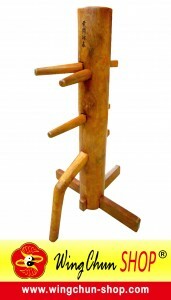 An example of the correct and authentic Ip Man Wing Chun wooden dummy is available at Ip Man Tong and VTAA. The next step is to learn Mok Yan Jong form by utilising the wooden dummy. As the wooden dummy represents a human being (or a foe), implementing Mok Yan Jong to a wooden dummy exercises Ip Man Wing Chun in a practical combat situation. As has been said previously, Mok Yan Jong is the combination of the three empty-hand forms. Therefore, the techniques used in Mok Yan Jong are the essential pieces of the other forms, combined into a dynamic and harmonic form that maximises a strong stance, powerful hand movements, and a steady yet flexible body movements. All together, Mok Yan Jong is an advanced form, formidable, and practical in fighting situations.